We are trusted as reliable Manufacturer, Exporter & Supplier ofÂ Steel Tee. The Steel Tee, we offer, are made as per the set industrial standards by utilizing well-tested material. Various quality tests are conducted on Steel Tee prior to its final dispatch. 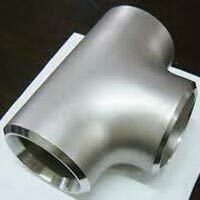 We provide the Steel Tee to the clients in assorted grades & other related specifications at the market leading price. One can placer retail as well as bulk orders for Steel Tee with us. Grades :Â ASTM A182 F304, 304L, 304H, 316, 316L, 317, 317L, 321, 310, 347, 904L, Etc.